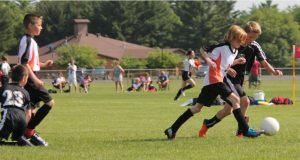 If your children play youth sports in metro Atlanta and need a pre-participation physical for your league or school, Freedom Orthopedic in Dunwoody will do a complete sports physical by board-certified orthopedic surgeon, Dr. Christopher Vaughn, for just $20. You’re in and out quickly with no waiting. Bring any required forms or paperwork and we’ll do the rest. Youth sports can get expensive. The Sports physical shouldn’t be. Call 404-998-0936 for a no-wait appointment.